Here in New York where I live, there is only one species of Hummingbird, and we see this specimen only when we look hard at where we are and what’s going on. Yet, in the tropics, flitting through all levels of forest in Costa Rica, you see hummingbirds hustling about their duties. In terms of ecology, the hummingbirds and the plants that are their food supply have a very intimate, dependent relationship. Without the hummingbirds, those vibrant red flowers with their deeply cupped shape would not be able to reproduce. And without the carb-loaded sweet nectar found within the depths of those flowers, the hummingbirds would not be able to survive the night. 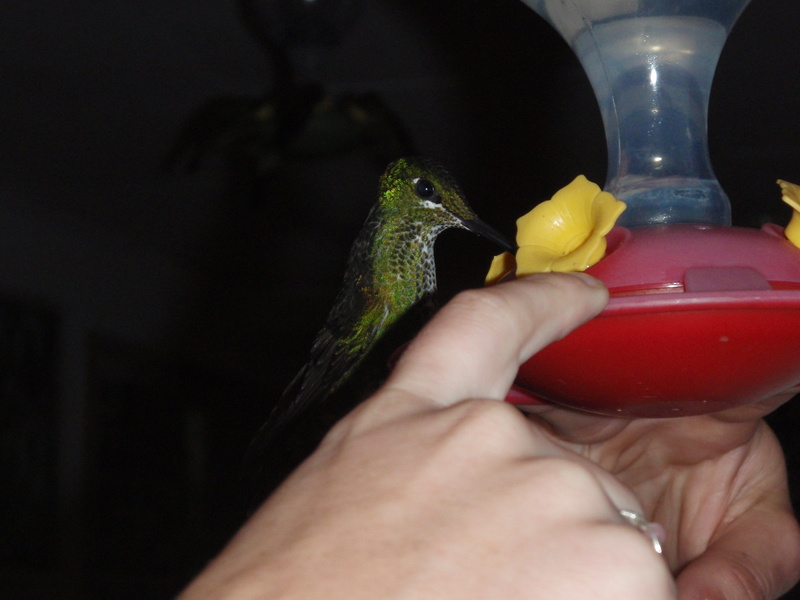 We were blessed with the opportunity on our travels to visit a hummingbird garden area a few times. We got to watch the hummingbirds fight and challenge each other over the previous spots along the feeders for at least an hour in the dim light of the setting sun. Hummingbirds use so much energy during the day that sometimes they fall into a near-death state, called torpor, at night to conserve their energy. Can you imagine running yourself so near death everyday that you’re not really sure if you’ll be able to get your heart working in the morning? Slow down! It works for the hummingbirds. It doesn’t work for us. There is something to be said about the perseverance of these little birds with their flashy colors and quick moves, but they are made for their job. We learn to take life one step at a time from these little creatures, some of which are no bigger than the size of your hand. Hey guys – this post actually stems from a very odd dream I had last night, which I would like to at least study in a broad, magic relevant context. As we all know, the time between Mabon and Samhain just flew by, and we’re looking at an upcoming new year. At this time, it is especially important to be paying attention to those signs and omens all around you. Why did that particular bird just fly over you? What are your dreams filled with? Last night, I had a bit of an issue with sleep, but between 7 and 9 am today, I had a dream which involved my roommates and our apartment, a small, gray kitten, and a large, lion-like cougar. We were, for some reason, in our apartment which was translocated onto the middle of my campus (don’t ask me why!). We looked outside, and rounding the corner, prowling, was a large cougar. We grabbed the kitten and held her as far inside as we could, and I grabbed my phone to take pictures as it was going by us at a dead-on run. My picture didn’t come out. I then called 911, to explain that there was a cougar in the middle of our campus. They redirected us, and said that we were on national radio, and asked if we wanted to join them in a prayer. I woke up. Checking my Animal-Speak book, I found that Cougars are a sign of mastering yourself and beginning to assert yourself and your knowledge in your everyday life. Because cougars are paired with their prey – deer, and porcupines – we must study those as well. Although no deer or porcupines were apparent in my very weird dream, it is wise to remember that deer are gentle, and have mechanisms for blending in, which the cougars can see right through. In addition, cougars have a fantastic ability to capture and eat porcupines without any major harm to themselves. The ability to pick through a (pardon the pun) sticky situation is one that a cougar possesses. Its interesting to note also, that in the region I am in, there are no wild, large cats. According to the DEC of New York, there are no cougars in the state – but there are bobcats and bears. I can’t remember why, but I was reading and viewing a substantial amount of user submitted proof to the contrary one night a long time ago. That aside, I have never experienced a large cat (or a bear) in the wild, and I doubt I will while remaining at home. So, on the eve of our new year, what can this indicate? That I have begun to master myself and express my knowledge? I do feel like I am coming into my own. I know that I am strong, and I know that I am capable of surviving on my own. Mabon was all about independence – and Samhain is on the rise. Samhain’s primary energy, by my own personal determination, is that of Communication. How fitting. Have any weird dreams lately? I have not dissected what they mean, yet. But, I thought I should include you in my areas of observation. I was walking out of class, after speaking to a teacher about speaking to his class about novel writing, and I make my way towards my apartment building. There in the sky, come two large birds, screeching as they, yet again, disappear from sight. Upon pursuing them, of course, I can’t find them. Its happened a few times. With, of course, the screeching being analogous to the cries of Red Tails, my preferred bird and the one I tend to see the most when looking for symbols. This morning, however, I was simply trying to go home. Hawks are generally associated with, according to Ted Andrews of Animal Speak, “It may pop up as a totem at that point in your life where you begin to move toward your soul purpose more dynamically”. He also says, it teaches to see, and to ‘fly to great heights while still keeping your feet on the ground’. I also spotted a ladybug on my way back to my apartment – which I held, briefly, before allowing him to fly off to his next task. He was just chilling on a blade of grass. I mention these without the intent of interpreting them to the world, but instead to remind you that all creatures – great and small – or the way that the trees whisper as you walk by – can lend clues to your cycles of life. Some great resources for omen/association identification follow. This seems to be my advertising post, first one in a while, so hang in with me. When I think of something more spiritually inclined to write about, I most definitely will. But, both of these things which I am talking about below have affected me in the best possible spiritual way. I may have mentioned the book before. But, I finally decided to start taking a chunk out of it, metaphorically of course as I would never injure a book. I’ve gotten to the end of chapter three, and I am amazed at how simple, logical, and respectful Ted Andrews was in writing this book. He makes things both easy to understand for people who may not be pagan/wiccan/nature oriented, and also is able to remind me of things which I tend to forget in every day life. The visualization exercises are so well written that, upon reading them, I am nearly sucked into the vortex of my mind. I haven’t even gotten to the omens chapter yet! Its an enjoyable read and I wouldn’t hesitate to recommend it to anyone, Christian, pagan or in between. Animal Speak is a great read. Don’t be surprised if I mention it again and again. Colder Than Death – a story about a young woman who is stalked and then kidnapped by her stalker. Unfinished. 53,000 words. “The Kids” – a story about a bunch of kids banding together to create a secret society. Unfinished. 55,000 words. How Can You Love ‘Em If You’ve Never Met ‘Em? – A story about a young woman who falls in love with a man over the internet. Finished. 60,000 words. Immortal Burden – The characters from Immortals’ Gift return to usher a boy into the world of the Gods, as the leader of all earth-born god-children. Finished. 56,000 words. NaNoWriMo challenges your creativity, productivity, and will power. When you can write a novel in a month – you can do anything! That’s all for now, folks. I’m headed home.